Carole Cepeda Needs Immediate Support! 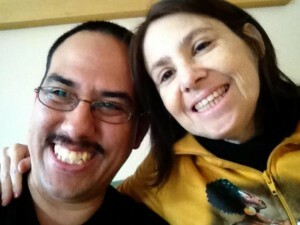 My wife, Carole Cepeda, has been diagnosed with Angiosarcoma. The doctors have given her 6 months to live. Carole moved to Canada on January 5th, 2013 for two reasons: to be closer to her family and to receive Canadian Health Care on April 2013. Carole suffers from constant, daily pain and is easily fatigued. Even with the many medications she’s been prescribed, it’s a challenge even getting up in the morning. I have been praying daily for God to work a miracle. I would love nothing better than being there for Carole in her time of need, however, my job keeps me in San Antonio, Texas. In order to receive the necessary health care, I need to continue working. My employer is willing to allow me unpaid days off to visit Carole every other week in Canada, but, as you can imagine, the transportation costs will be significant. Moving to Canada would be ideal, unfortunately, seeking Canadian employment is a difficult task. Many documents will need to be settled and signed – very time-consuming and time is a commodity we just don’t have. I have resorted to accepting donations via Paypal. I will use any funds raised for airfare, re-locating and, of course, medical expenses. Thank you for your prayers and support to us. Please visit Carole’s Facebook Page.